Whenever I buy appliances for my properties, I always tell salesmen that I am willing to pay more for energy-efficient models, like stoves without pilot lights. I hate pilot lights! Pilot lights are not just an inefficient use of energy; like driving a Hummer to the post office to buy a stamp. Pilot lights are a complete waste of energy. 100% of the energy used by pilot lights is wasted! All my units have gas stoves. Gas cooks better than electricity, and it is much cheaper. When I buy stoves, I always insist on spark ignition. Spark ignition stoves cost about $50 more than stoves with pilot lights, but they use far less energy. Yes, they still make stoves with pilot lights, and believe it or not, 1/3 of the gas used by a typical stove with pilot lights will be consumed by the pilot lights themselves. For people who don't do much cooking, the pilot lights may consume 70% to 90% of all the gas used! The reason this figure is so high is that a stove has 3 pilot lights, one for the oven and two for the top burners. What an incredible waste of energy! Even worse, there are many gas appliances that are unavailable with spark ignition. For example, all of the gas water heaters and wall furnaces sold by Home Depot and Lowe's have pilot lights. I don't know why. Spark ignition technology has been around for a long time. All gas clothes dryers sold in the U.S. have had spark ignition for over 30 years now. The fact that neither Home Depot nor Lowe's have any spark ignition water heaters in stock is just one example of how really wasteful we still are as a nation with energy. I think the government should ban the sale of all household appliances with pilot lights, and eventually they probably will. BEWARE OF HOTEL MYSTERY FEES. Last year, when I checked out of a hotel in Reno, I discovered a charge on my bill of $24.95 a day for something called 'Resort Fee.' I asked the hotel clerk what this charge was for. She said it was for use of the hotel spa. I told her that I was in Reno attending a magic convention, and that I didn't use the spa. I didn't even know the hotel had a spa. She said that the Resort Fee was a valid charge because if I had known that the hotel had a spa, I could have used it! I asked to speak to the manager. I told him I would not pay this 'Resort Fee' and demanded that it be taken off my bill. He agreed to take the charge off my bill on condition that I sign a form saying that I did not use the spa during my stay. Since he had a stack of these forms on his counter, it was obvious that I was not the first person to complain about this. I was at this hotel for 4 nights, so that took $100 off my bill. Charges like this are becoming far more common as hotels try to beef up their profits in a difficult travel market. Here are some other annoying and common Mystery Fees. Mini-Bar Restocking Fee. Most people know that hotel mini-bars are ridiculously expensive. Here are some prices from the Mini-Bar Menu at the Claremont Hotel in Berkeley/Oakland: 12 ounce can of Pepsi $3.25. Potato chips $5.25 a bag. Cashews $9.25 a bag. Peanut M&Ms $4.25 a bag. Oreos $4.75 for 6 cookies. Now, a growing number of hotels are also charging $10 to $20 a day just for opening the door to the mini-bar. Its called a Restocking Fee, and you get charged this fee just for looking inside the mini-bar, even if you take nothing out! I know that sounds unbelievable, but its true! 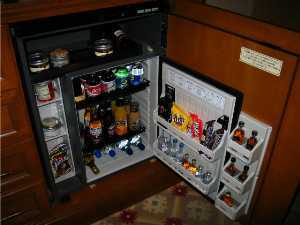 At many hotels, a sensor inside the mini-bar tells the hotel's computer when the door to the mini-bar has been opened. Some hotels reason that once a guest has opened the door to the mini-bar, a hotel employee will have to take inventory later to see if anything is gone, and that justifies a Restocking Fee. Mini-Bar Unstocking Fee. If you ask the hotel to take anything or everything out of the mini-bar refrigerator because you need the space for baby formula, medicine, special dietary food, etc; be prepared to pay an Unstocking Fee of $30 to $50. You will probably also be charged a Restocking Fee because the hotel will have to put all their stuff back in the refrigerator after you leave. Internet Connection Fee. This is commonly $9.95 a day. Before agreeing to this fee, you might want to see if your room is a Wi-Fi hot spot first. Mandatory Gratuity. This is often 15% to 20% of your bill. They charge this just in case you didn't tip the maid because the service was lousy. Energy and Water Surcharges. These are now very common. Hotels don't meter individual rooms, so they have no way of knowing how much electricity or water a guest uses during his stay. Therefore, this is not really a charge for energy or water use. Its just extra income for a hotel. These fees are known in the industry as "hospitality surcharges." According to Price Waterhouse, the hotel industry made $2 billion last year from hospitality surcharges, up from $1 billion 3 years ago. I prefer to call these charges Mystery Fees because there is nothing hospitable about them! What can you about this? Ask to see and pay your bill the night before you check out! Hotels get away with their Mystery Fees because most people are in a hurry to check out and don't have time to review or dispute their bill. Once you have paid a hotel bill, it is very hard to get a refund later. Many landlords also charge Mystery Fees. My favorite is the Multicheck Processing Fee. This is a fee that some landlords charge tenants for paying the rent with more than one check. On the web site of a large apartment complex in Oakland, it says that their $50. Multicheck Processing Fee is to cover "the extra handling costs associated with receiving multiple checks." I often receive 5 or 6 checks from a group of tenants to pay a month's rent. Yes, it is more convenient for a landlord to get 1 check rather than 6, but its really no big deal. I think landlords should avoid Mystery Fees. They generate more ill-will than income. Mint Flake Ice Cream Topping and Dark Chocolate Flake Ice Cream Topping. WORST APPLICATION EVER. Here's another candidate for this coveted title. Do you like string? In 1995, I got an application for an apartment in Berkeley from a memorable young couple. The guy seemed OK, but his girlfriend was obviously strung out on drugs. She had a hard time keeping her balance. After looking the place over, they sat down on the couch in the living room. He began filling out application forms for both of them. She was oblivious to the world. She just sat there, humming random musical notes while playing with a piece of string. She dangled the string in front of her face and twirled it around, as though she was toying with a cat, but there was no cat. I said to them: "Do either if you have any questions?" He shook his head 'No.' She looked up at me. Her eyes were dilated. She said: "Do you like string?" I said: "Uhm, yes, I like string." Then she said: "Yeah. String is great. I like string a lot." She then resumed humming and continued playing with her piece of string. Then I said: "Do either of you have any questions about the apartment?" I added the words 'about the apartment' because I didn't want to answer any more questions about string. The guy said: "No," but she didn't hear me. He handed me the application forms that he had filled out for both of them and then escorted her out of the apartment. As they walked to the door, she looked around the room with a 'Where am I?' expression on her face, if you know what I mean. They didn't get the apartment. Poker Table. This sturdy folding hardwood poker table measures 30" x 30". It has a vinyl leather-like top. I have one.